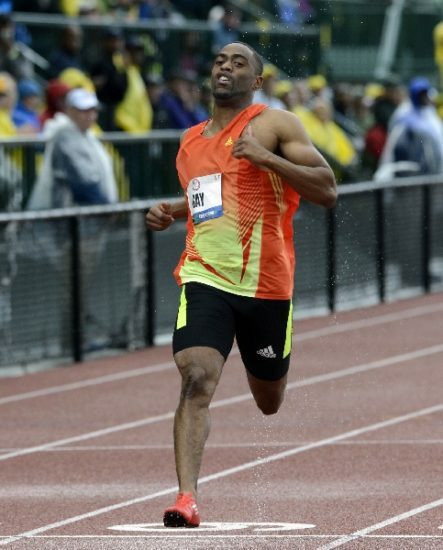 NEW YORK (Sporting Alert) — Tyson Gay, Veronica Campbell-Brown, Warren Weir and David Rudisha were all among the winners at Saturday’s adidas Grand Prix held at Icahn Stadium. Gay, who has been in good form so far this season, won the men’s 100 metres, easing down in the closing metres to take first in 10.02 (-0.8 m/s) seconds. He had earlier won his heat in 10.30. Second in the final went to American Ryan Bailey in 10.15, with Trinidad and Tobago’s Keston Bledman getting third in 10.16. Jamaica’s Olympic relay gold medallist Nesta Carter was fourth in 10.29, but his fellow countrymen Nickel Ashmeade, who won his heat and Kemar Bailey‑Cole finished further down. Jamaica’s Aleen Bailey ran 11.37 to win the women’s race, edging out Mikele Barber, who crossed in 11.39. Jamaica’s 2004 and 2008 Olympic gold medallist Veronica Campbell-Brown won the women’s 200m in a seasonal best of 22.53 seconds (-1.4 m/s), holding off the fast finishing Anneisha McLaughlin (JAM), who ran 22.63 for a season’s best as well. USA’s Shalonda Solomon was third in 22.91 and another Jamaican, Sherone Simpson was fourth in 22.83. The men’s event went to Jamaica’s Olympic bronze medallist Warren Weir, who cruised home in a season’s best of 20.11 secs after separating from the field coming off the corner. Michael Tinsley chased down Olympic bronze medallist Javier Culson to win the men’s 400m hurdles in season’s best of 48.43 seconds. Trailing Culson and fellow American Johnny Dutch with two flights of hurdles to go, Tinsley powered between them to take the event. Puerto Rican Culson, who fell to the track after crossing the line was second in 48.53, with Dutch taking third in 48.78. Ryan Brathwaite of Barbados, the 2009 World champion, won the men’s 110m hurdles in a season’s best effort of 13.19, with Orlando Ortega of Cuba and Russia’s Sergey Shubenkov following him home in 13.24 and 13.29, respectively. Amantle Montsho of Botswana stamped her class in the women’s 400m dash, winning with another sub-50 seconds effort as she continues her preparation on the road to defend her world title later this summer. Montsho, who recently beat American Allyson Felix to set a year best of 49.88seconds in Doha, posted 49.91 to break the meeting record of 50.04, which was previously held by American Sanya Richards. USA’s Natasha Hastings finished very strong to take second in 50.24, beating her teammate Francena McCorory (51.06) and Jamaica’s Novlene Williams-Mills (51.12). Josh Mance won the men’s 400m in 45.59, beating Kevin Borlee of Belgium, who clocked 45.71 and Jeremy Wariner (45.72). In the men’s 5000m, Hagos Gebrhiwet of Ethiopia ran the closing laps all on his own, but still managed to post a world-leading time of 13:10.03. The men’s 800m went to Kenya’s World record holder and Olympic champion David Rudisha in 1:45.14 and he look to have taken his foot off the gas with 50m left. Olympic Games and reigning European champion Sandra Perkovic of Croatia dominated the women’s Discus after setting a new meeting record and world-leading mark of 68.48m to take the pole position. In fact, only one of Perkovic’s marks were below the Meeting Record, while she produced her best effort in the final round. The Croatian held the previous world best at 68.23m, which she set in Doha. USA’s Gia Lewis-Smallwood was second with 61.86m. Cheered on by the crowd, fellow Croatian Blanka Vlasic won the women’s High Jump with a clearance of 1.94m, which equals the meet record. Emma Green Tregaro of Sweden and Brigetta Barrett of USA both cleared 1.91m and St Lucia’s Levern Spencer did 1.85m. Elsewhere in field events, Ryan Whiting of USA continued his impressive showing this season after winning the men’s Shot Put with a throw of 21.27m, beating fellow American teammates Reese Hoffa, who did 20.69m for second and Cory Martin (20.60m). Janay DeLoach Soukup set a meeting record of 6.79m to win the women’s Long Jump, as world leader and Olympic champion Brittney Reese could only manage 5.99m for 8th. In other results, Christina Obergfoll of Germany won the women’s Javelin Throw with 65.33m, Benjamin Compaore of France won the men’s Triple Jump with 16.45m.